In 2002, I was not yet an art detective. I was in the midst of earning advanced degrees in art history and history. But, the Bingham Portrait Project, my search for George Caleb Bingham portraits, had brought me to the attention of a board member of an historic site. The organization owned a Bingham portrait of a young woman, Fannie Medora Sombart, that had been donated to them 15 years before. The board members and volunteers, almost exclusively women, displayed their most valuable artifact by their beloved Missouri Artist in the main hall across from the grand staircase. In their home tours, they featured it. From the beginning, I knew George Caleb Bingham was not the artist. Nothing about the piece resembled Bingham — size, palette, pose, brushwork. The painting was taller and narrower than any portrait by Bingham; the palette, not as harmonious; the pose, a bit awkward; the brushwork, busier. Modeling was not as crisp or as psychologically engaging. But, there was something else that was absolutely wrong that I couldn’t quite put my finger on. Finally, I figured it out. The subject’s clothing was different from any other Bingham portrait. She wore a slim skirt, a bustle, a laveuse (extra fabric draped over the hips like a washerwoman’s apron), and small straw bonnet with an upturned brim. These styles came into fashion in the 1880s: Bingham died in 1879.The fashion plates below show that in 1879, with swirls of fabric, designers emphasized the skirt. In 1880, the emphasis had moved up to hips through the addition of a laveuse and a bustle. The portrait subject appears to wear both a bustle and a laveuse, neither of which came into fashion until after George Caleb Bingham’s death. Such lies and unethical actions are not uncommon in the art world. The ethical standards and guidelines are constantly broken. The average person does not know how to avoid art fraud. The average person does not notice the inherent conflict of interest of art dealers selling the same pieces they authenticate. For reasons I do not fully understood, I felt a commitment to right this wrong. As an art detective, am I quixotically tilting at windmills? Or am I restoring the integrity of George Caleb Bingham’s legacy – and the legacies of other artists – one portrait at a time? In the large scheme of life, this work is small, but with each correct attribution, it feels as though one small piece of the universe is back in order, and that fewer artists are spinning in their graves. Not all corrected attributions are heart-breaking. Far more often, the truth resonates with the portrait owner. More than 80% of my clients become life-long friends. The clue to solving the mystery of an antebellum portrait of a young woman was in the auction house description, “the subject was a relative of David Rittenhouse (1732-1796), first director of the U. S. Mint.” The name rang a bell, and a bit of research revealed that David Rittenhouse was also one of early America’s foremost mathematicians and scientists, second only to his friend Benjamin Franklin. How could a portrait of a descendant be by an unknown artist? How could such a demure, poised young woman be nameless? The investigation began, as always, by determining when the portrait was painted. Only in the mid-1840s did women’s hairstyles combine a deep wave on the cheek with an exposed ear, the date could easily be placed in the mid-1840s. The next question was where. Initial genealogical research into the family of David Rittenhouse disclosed that the family remained in or near Philadelphia for generations. The auction house supplied a handwritten note and postmarked envelopes that the seller retained from his private purchase in Philadelphia in 1976. The letter contained little salient information concerning either the provenance of the portrait or the identity of subject or artist. The signature was not completely decipherable and did not fully match the monogram on the stationery. The postmark on the front of the envelope and the return address and note on the back of the envelope provided clues. The postmark was Flourtown, Pennsylvania. The return address named the owners, Irvin and Dolores Boyd, of Meetinghouse Antiques in Fort Washington, Pennsylvania. The note read “Female Portrait in Living Room,” indicating the portrait was part of an estate the Boyds purchased or a sale they managed. The Boyds founded Meetinghouse Antiques in 1959. It still exists today and is owned by their daughter, Priscilla Boyd Angelos, as Boyd’s Antiques. I contacted her. Much to my surprise, she responded, “I do know the woman who sold it to my dad was a descendant. She lived in our town and just died at the age of 88 in August of last year.” She also knew the married name of the individual. The married name fit the stationery’s monogram. By descent in the Rittenhouse family, sold to Meetinghouse Antiques, Fort Washington, Pennsylvania, 1976; sold to private individual in Cuyahoga, Ohio, 1976; to public auction in 2014, to current owner. But which descendant was the sitter and who was the artist? The name of the artist proved elusive until I studied the Rittenhouse family thoroughly. As I researched, I kept in mind that since the portrait subject appeared to be in her late teens or early twenties, and that the date of the painting was circa 1845, her birthdate should be somewhere around 1820. But, to learn for certain who she was, I had to begin with David Rittenhouse. Several facts deepened my study. The family history of the young woman in the portrait included not just the brilliant mathematician/ scientist, David Rittenhouse, but also Jonathan Dickinson, president of Princeton University; Founding Father Jonathan Dickinson Sergeant; Thomas Barton, the designer of the Great Seal of the Republic, and William Paul Crillon Barton, first Surgeon General of the United States Navy. The complete story of the fascinating family history can be found here. Below is a family tree illustrated with prints and portraits. See footnote  for further information on each image. 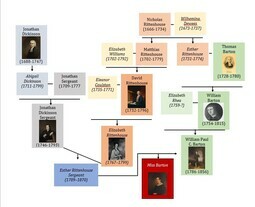 In following the family history of David Rittenhouse to 1845, I discovered that by the fourth generation, the Rittenhouse genealogy decreased to only one branch. The name Barton replaced David Rittenhouse’s surname when his granddaughter, Esther Sergeant married William Paul Crillon Barton. William and Hetty Sergeant Barton had 14 children. Seven daughters lived to adulthood. One of those daughters must be the subject of the portrait. The two oldest daughters, Elizabeth and Julia, both married in 1840. But, the sitter did not wear a wedding ring so neither is the subject of Portrait of a Young Lady. Adeline was 27 in 1845 and probably was too old to be the subject. Emma was 23; Mary, 22; Lavinia, 18; and Selina, 15. One of those four daughters is the young woman in the portrait. A search in all the historical societies and archives in and around Philadelphia area brought up nothing for any of those names. For now, the identity of the subject is Miss Barton. Still left to be known was the artist’s identity. In the mid-1840s, America’s first art center, Philadelphia, still held its own against New York City’s growing art world. The most popular portrait artist in Philadelphia for decades was Thomas Sully (1783-1872). Long, graceful fluid lines characterize Sully. He came from a family of actors and his paintings often have the feel of a stage set. Portrait of a Young Lady was far too practical to be by Sully. The portrait was also too anatomically correct. Sully could paint a fine picture, but when closely examined, necks and arms are disproportionately long. Sully’s son-in-law, John Neagle, rivaled his father-in-law in popularity. Some of his portraits exhibited the same dark palette, similar dark eyes, a comparable light source and similar shading as Miss Barton. But Neagle relished putting the accoutrements of a subject’s profession in portraits. There were none in A Descendant of David Rittenhouse. Morellian analysis proved John Neagle was not the artist. The answer to the artist’s identity lay in the foray into family history. 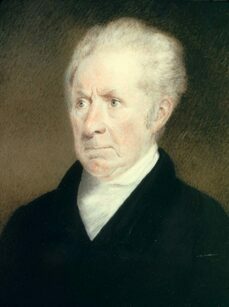 A cabinet-sized portrait of the father of the Barton sisters exists, Dr. William P. C. Barton, 1831, owned by the Philadelphia Museum of Fine Arts. The artist: William James Hubard. I immediately saw not only the family resemblance, but also the hand of the same artist. An image of a portrait by William James Hubard, Henrietta and Sarah Mayo, shared by an expert on Hubard, confirmed the identity of the artist of Miss Barton. William James Hubard (1807-1862) deserves a page unto himself. Find it here. In my opinion, the portrait of a Descendant of David Rittenhouse, purchased at auction in November 2014, was painted by William James Hubard (1807-1862) in Philadelphia, probably in the late winter or early spring of 1844. 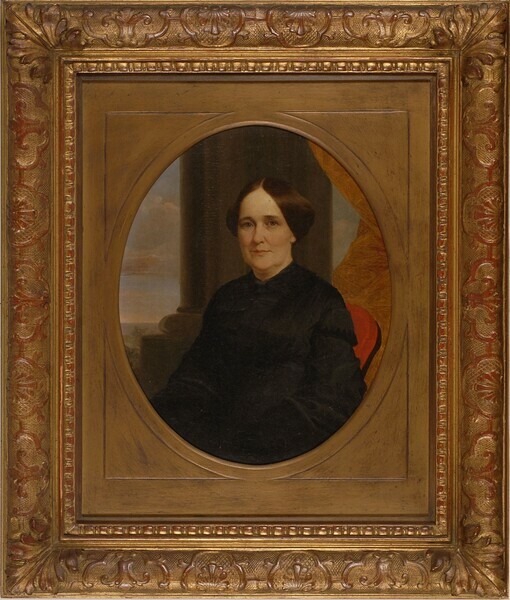 The subject was Miss Barton, one of four daughters of William P. C. and Elizabeth Rittenhouse Sergeant Barton: Emma Barton (Mrs. Frederick Carroll Brewster) (1822-1882), Mary Barton (1823-1856), Lavinia Barton (1827-1895); or Selina Barton(1830-after 1871). Images in the family tree, beginning at top left and moving clockwise, are: Edward Ludlow Mooney, Jonathan Dickinson, Oil on Canvas, 30 x 25 inches, Princeton University Art Museum, Gift of the Artist, PP6; Charles Willson Peale, David Rittenhouse, 1796, Oil on Canvas, 49 x 39 1/2 inches, National Portrait Gallery, Smithsonian, NPG.98.73; Unknown Artist, Thomas Barton, No Date (ND), “Thomas Barton (1730-1780),” Penn Biographies, http://www.archives.upenn.edu/people/1700s/barton_tho.html, accessed December 2014; Copy after Charles Willson Peale, William Barton, ND. “William Barton (heraldist),” https://en.wikipedia.org/wiki/William_Barton_(heraldist), accessed December 2014; William James Hubard, Dr. William P. C. Barton, 1831, Philadelphia Museum of Art, 2009.77.1; Miss Barton; Charles Willson Peale, Elizabeth Rittenhouse (Mrs. Jonathan Dickinson Sergeant), 1789, Private Collection; Charles Willson Peale, Jonathan Dickinson Sergeant, 1786, Gift of Jonathan Dickinson Sergeant, Princeton University Art Museum, PP163. The Puzzled Witness, 1874, is George Caleb Bingham’s often overlooked last genre work. For 40 years, Bingham witnessed the people and the the politics of Missouri, and the nation. With hard-earned artistic skill and well-reasoned political perspective, he portrayed his observations. Sometimes he put himself in the picture as one of many characters in a scene, usually as the one recording the events. In The Puzzled Witness, he placed himself at center stage for the first time and evaluated his role as witness. Unlike Bingham’s best-known colorful, active outdoor paintings of the antebellum years, Puzzled Witness is set in a dark, motionless interior. This last genre scene is even darker that his earlier genre works such as Country Politician, 1849, or The Checker Players, 1850, and lit more dramatically. The composition’s asymmetry focuses the viewer’s eye on the witness. He is a short man clothed in plain homespun. He wears boots and clutches a rumpled hat. His dog sits behind him. The rest of the men in the room wear shirts with stiff upturned collars, suits, vests and shoes. The witness is the only participant who does not a tie. The defense attorney sits at the end of a cluttered table. Scraps of paper have fallen to the wooden floor. The clutter is reminiscent of the symbolic disorder in the foreground of Raftsmen Playing Cards, 1847, or In a Quandary, 1851. Bright light on the clear portion of the tabletop draws attention to the witness’ empty white shirt. This focus has no other precedent in Bingham’s work. The artist has seized upon the strong moment. The witness for the prosecution is up, and the attorney for the defense has just put a puzzler to him. It is a stunner. The witness is, in point of fact, stumped. He scratches his head for the answer, but it don’t seem to be there, or perhaps, it is a neat bit of acting. In contrast to the forthrightness of Order No. 11 (see below), Bingham reveled in ambiguity in The Puzzled Witness. The St. Louis art critic could not determine if the witness was truly “stumped” or acting. In 1874, nearly a decade after the end of the Civil War, some of the Missourians displaced by Order No. 11 had returned to the region. They, and those who had remained in the region throughout the war, tried to recover their lives, but many were disenfranchised. To assimilate into the post-war world, these usually rural folk had to dissemble their true feelings. They had not yet forged a Midwestern identity to circumvent the Union-Confederate division. The Puzzled Witness may represent their awkward circumstances. Even more, the painting addresses Bingham’s feelings. George Caleb Bingham is the puzzled witness. Before and during the Civil War, Bingham worked for a unified nation with a strong central government. When that same government failed to halt the atrocities of total war on the western frontier, as he later memorialized in Order No. 11 / Martial Law, his faith diminished, but he continued to serve as state treasurer for Missouri’s Union government. The wounds of war were still too fresh for others to comprehend his distinction between questioning of the excesses of governmental power versus treasonous criticism. These misunderstandings of the painting’s intent by critics and viewers widened his personal ideological rift. Later, the government denied him compensation for his Kansas City home that was confiscated and destroyed by Union soldiers. Still he worked as Missouri’s Adjutant General to help other victims receive justice. He’d been a Whig, upholding republican principles for most of his life, but by 1878, his devotion to a strong federal government wavered. He had married a relative of Stonewall Jackson and asked to be buried facing south. The resemblance to the central character and to Bingham can be seen in an 1878 photograph: straight bushy eyebrows, square face, strong chin. The Puzzled Witness gazes at the tabletop. The clutter may symbolize the complicated history he witnessed. After the Civil War and during and after Reconstruction, there was no easy answer for life at the Kansas – Missouri border or for an artist of deep thoughts and feelings. Michael Edward Shapiro posited the theory that George Caleb Bingham himself is the “bewildered” witness in George Caleb Bingham, (Harry N. Abrams and the National Museum of American Art, 1993), 135, 137. If you are already familiar with the portraits of George Caleb Bingham, especially Mary Ann Gilliss (Mrs. Benoist Troost) at the Nelson-Atkins Museum of Art in Kansas City, Missouri, then you know at first glance that George Caleb Bingham painted the portrait of Frances Booker George. Her full name was Frances Annabelle Booker (Mrs. James W. George). Several years ago, the painting went up for sale at auction with the artist listed as “American School” through an unfortunate combination of over-zealous re-attributions by a young curator over half a century before and a clerical error. At the last moment, the small treasure was rescued from oblivion. Nelson-Atkins Museum of Art, Ancestor Exhibit, 1953, Catalog #91. To understand this attribution, it is necessary to know that the portrait of Fanny A. Booker (George) is one of three family portraits. The others are portraits of a son, Richard Booker George (1839-1862), and a daughter, Julia George (1850-1869). Before beginning detailed comparisons of the portraits with comparable images by Bingham and Herzinger, I reviewed Bingham’s students. In the late 1860s and 1870s, William Morrison Hughes had lived in California for over a decade. George Calder Eichbaum, had developed his own individual, more romantic style and elaborate brushstrokes. A third, Lou Swann Carson, simply did not yet have the technical skill. All three could be ruled out as the artist. Turning to Emile Louis Herzinger (1838-1887), I learned that he worked as a painter, a photographer, and a colorist of photographs. As a painter and colorist, he used a variety of mediums: charcoal, watercolors, gouache, pastels, colored crayons, and oil. I found images of Herzinger’s work at the Missouri Historical Society, the Missouri Botanical Gardens, the Western Reserve Historical Society in Cleveland, and the Frick Reference Library. I enlarged and compared three public images of Herzinger artworks side by side with Julia George and Richard Booker George. Herzinger’s brush was more heavily laden with paint; his brushstrokes, more labored. In contrast, not only could Bingham’s basic techniques be seen in all three George portraits, but the older artist’s mature ease with palette and brush. Herzinger worked from a studio in St. Louis, Missouri. The Georges lived on the other side of the state in Kansas City. Their home was only a few miles from Bingham’s studio. Herzinger signed his work. The portraits of Fanny, Richard, and Julia George, like most Bingham portraits, are unsigned. Fanny was painted from life two decades earlier than the portraits of her children. Richard and Julia were painted posthumously, probably from photographs, in the late 1860s or early 1870s. If Bingham ever met Fanny’s offspring, they were children at the time. Adding his usual psychological engagement with his subjects proved to be an impossible task, but in person, face to face with Julia George, the hand of Bingham was unmistakable. Both connoisseurship and logic led me to conclude that the 1953 curator, without the benefit of computers or internet to aid his memory, probably made a mistake. In my opinion, he mistook the deadpan expressions of the two dead George children for the competent but uninspired work of Emile L. Herzinger. How the curator could have mistaken Frances Booker George for a Herzinger is beyond me. I wonder if that third re-attribution was a clerical error. Among the early settlers of Shelby County, Kentucky, was the Booker family. Richard Marot Booker (1751-1805) and his wife Elizabeth Palmer (1751-1830) came to the region from Amelia County, Virginia about 1796. With them was their first-born son, his father’s namesake, 23-year-old Richard M. Booker, Jr. (1771-1845). Before leaving Virginia, the younger Richard had married 18-year-old Tabitha Fuqua (1777-1834). By 1820, the younger family had seven children and owned 21 slaves. One of those seven was Frances Annabelle Booker, born in 1805 on the family farm, Willow Brook, north of the road between Louisville and Frankfort. On October 11, 1827, when Fanny was 22, she married her neighbor, James Whitefield George (1805- 1888). Parents of the groom were Moses S. George (1768-1845) and Margaret Holmes (1773–1858). Like the Bookers, the Georges had moved to Shelby County from Virginia. Their home had been from Fauquier County. In 1830, Fanny and James lived on their own farm with five slaves and the first of their nine children, Benjamin R. George (1829-1856). By 1840, they had five more children: Moses Booker (1830-1906); William L. (1832-1897); Martha (1834-1854); Morton Bradley (1836-after 1880); F. M., a daughter (1838-), and Richard Booker (1839-1862). In 1841, they lost an infant son whom they buried in the family plot, now known as the Booker-George cemetery, at Willow Brook Farm. They had three more children by 1850: John Edward (1843-1920); Benjamin J. (1846-1896), and Julia, (1850 -1869). James reported that he owned 18 slaves and $27,400 worth of real estate. In 1853, James Geoge lost three slaves to typhoid fever, and his daughter Martha, to a typhoid epidemic. On June 12, 1855, Fanny gave birth to her eleventh, and last, child, James T. George, who did not live to the age of three. Their oldest and youngest sons died in next two years. Benjamin, 27, died August 27, 1856. 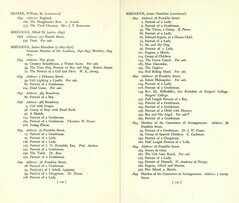 Little James’ death date was only recorded as 1857. Both were buried in the graveyard at Willow Brook Farm. Sometime after the deaths of Richard and Little James, the George family moved to New Braunsfels, Guadalupe, Texas, not far from San Antonio, where on November 17, 1858, their son William, 26, married a 17-year-old woman from South Carolina, Elizabeth Legette (1841-1905). The young couple moved to a farm just over the county line in Comal county. When the census taker listed the elder George family on July 26, 1860, James and Fanny, both 55, lived with four of their sons, Moses, 30; Richard, 21; Edward, 16; and Benjamin, 13, and with their daughter, Julia, 10. Their number of slaves had grown to 30, the value of their real estate had dropped to $15,300, but the value of their personal property was $41,400 – more than $1.2 million today. At the start of the Civil War, Richard returned to Kentucky. He enlisted with the 1st Kentucky Cavalry, commanded by General Benjamin Hardin Helm, a brother-in-law of Abraham Lincoln. James W. George wrote in his diary, “Richard Booker George was murdered in cold blood by Bob Carpenter whilst sitting on a fence at sunrise about the 13th of September 1862 near Scottsville, Ky. whilst in the rebel army…” The Georges would later commission George Caleb Bingham to memorialize their son in a posthumous portrait. 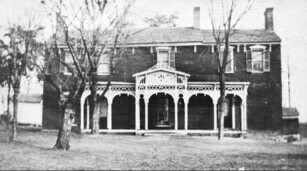 The Georges lived in Salt Fork, Saline County, Missouri, in 1880. John had married Sallie Gill. They and their three children lived with Fanny and James. John and Sallie’s only girl was an infant daughter named Julia. 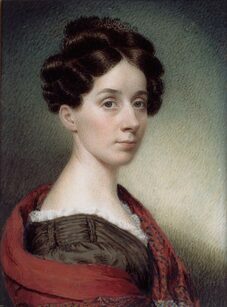 The facts of Fanny George’s life, and her mourning attire, indicated that Bingham created her likeness between the death of her daughter Martha on February 18, 1853, and the birth of her son James on June 12, 1855. Her pregnancy narrowed the time frame to a year. Originally, I tried to place the date of execution between 1855-1856 and 1859, which, from initial research appeared to be the most likely dates, but in comparing fashion plates and hairstyles, I was not entirely happy with my initial conclusion. Bingham was in Europe in 1857 and 1858, so those years had to be eliminated. Further research caused me to look earlier in the decade. Hairstyles and fashion plates for 1853 and 1854 fit comfortably. In the public record, I can find no evidence that Fanny George lived in Missouri before 1870. Travel between Kentucky and Missouri, however, was commonplace. Railroads connected the major cities. The Georges could well afford to travel out of Kentucky, especially when typhoid fever and cholera, ravaged the state in 1853-1854. Alternatively, George Caleb Bingham may have painted the portrait in Kentucky in May 1853. In a letter to his friend James Sidney Rollins from Lexington, Kentucky, dated May 22, 1863, he described his recent visit to Louisville, about 30 miles from Willow Brook Farm. George Caleb Bingham painted the portrait Frances Annabelle Booker (Mrs. James W. George), probably near Shelby County, Kentucky in May 1853. A century later, in 1953, the artwork was mistakenly attributed to Emile L. Herzinger. In 2012, at an East Coast auction, the portrait was put up for sale by “an Unknown American artist.” A connoisseur rescued the artwork from oblivion. Frances A. Booker (Mrs. James W. George) is now a proud possession of a Bingham connoisseur who recently discovered that Fanny George is a distant ancestor. Peter E. Palmquist and Thomas R. Kailbourn, Pioneer Photographers from the Mississippi to the Continental Divide: A Biographical Dictionary, 1839-1865 (Stanford University Press, 2005), 318. Herzinger signed three paintings from 1863 that were included in the Ancestor Exhibit. The similarities he saw could be the effects of photographs. E. Polk Johnson, A History of Kentucky and Kentuckians: The Leaders and Representative Men in Commerce, Industry and Modern Activities, Volume 3 (Lewis Publishing Company, 1912), 1579. United States Census Bureau, 1830; Fourth Census of the United States, “Household of James George,” “Shelby County, Kentucky, north of the road from Louisville to Frankfort,” National Archives and Records Administration (NARA) Series M19, Roll 41, page 259, line 18. An image from original death records lists Martha George, 20 years, Female, Single; Residence, Shelby County; Birthplace, Shelby County; Date of Death, 18 February 1854. In the column, “Name of Parents or Owners of Slaves,” are the words, “J. & F George.” Below the name of Martha, are the names of George, 35; Harriett, 35, and Henry, 15. All died of typhoid fever. Written faintly beside the age of the last three names is a “B” and by J & F George is written “owner.” The name of Martha does not have a “B” near it nor does “owner” appear with the name of Parents or Owners. I believe this indicates that Martha was not black and was a child of James & Frances George. By her age of 20, she should have been born about 1834 and there is space in the birthdates of the George siblings for her. That she was not listed in the 1850 census concerned me, but at 15, she would have been the right age for boarding school. There is no record of her in the Booker-George cemetery. That concerned me, too, but she was one of four deaths from typhoid. From the previous year’s death records, 1853, James W. George of Shelby County, lost six slaves, dates un-recollected. Four died from typhoid fever, one from dropsy, and one, a year old, smothered by mother. (Kentucky Birth, Marriage and Death Records – Microfilm (1852-1910). Microfilm rolls #994027-994058, pages. Kentucky Department for Libraries and Archives, Frankfort, on Ancestry.com, accessed October, 2016) From Google searches with terms, “Kentucky,” “Typhoid,” and “1854,” it is apparent that a typhoid epidemic raged through the state. Health providers eventually determined that contaminated ground water from the numbers of bodies buried was causing the epidemic to persist. I suspect that with seven deaths from typhoid fever, the George family eventually burned their dead. F. M. George, female, age 12, is listed in the 1850 census in the household of James George. She does not appear any other records that I can find at this time, including the 1860 census and in the records of the Booker-George cemetery near Shelbyville. I presume she did not appear in the census because she married by 1860, when she would have been 22. Information from Ancestry.com family trees, verified with records from Find-a-Grave and later censuses. No census documents from 1840 can be found for James W. George at this time. “Infant Son George,” Booker Grove Cemetery, Find-a-Grave, http://www.findagrave.com/cgi-bin/fg.cgi?page=gr&GScid=2411114&GRid=102172740&, accessed November 2016. United States Census Bureau, 1850 Slave Schedules of the United States Census, “J. W. George,” District 1, Shelby, Kentucky, M432, page 716, column 2, lines 22-40; United States Census Bureau, Seventh Census of the United States, “Household of J. George,” August 25th, 1850, District 1, Shelby, Kentucky, Roll: M432_218; Page: 291B, lines 26-33. United States Census Bureau, Eighth Census of the United States, “Household of William George,” September 13, 1860, Outside New Braunfels, Comal, Texas, NARA Roll M653_1291, Page: 217, lines 11-17. I could not find Morton George in the 1860 census. National Park Service, Civil War Soldiers and Sailors database, https://www.nps.gov/civilwar/search-soldiers.htm Records for the 1st Kentucky Cavalry show the unit near Scottsville, Tennessee in September 1862. Both George and Campbell may have been wounded in a battle in Tullahoma, Tennessee, in July 1862. Diary entry quoted in Nelson-Atkins Museum of Art, “#92, Richard B. George,” Checklist for the Catalogue: Ancestor Exhibit, 1953. United States Census Bureau, Ninth Census of the United States, “Household of James W. George, June 6th, 1870, Kansas City Ward 3, Jackson, Missouri; Roll: M593_782; Page: 591B, lines 1-4. United States Census Bureau, Tenth Census of the United States, “Household of J. W. George,” June 14/15, 1880, Salt Fork, Saline, Missouri; Roll: 716, page 16 , lines 41-50, and page 17, lines 1-6. I checked records on-line at Ancestry.com. One family tree gave her death date as 1881, but with no documentation. In the exhibition catalog from 1953, her year of death was 1882. I also checked Pre-1910 Birth and Death Database, Missouri Secretary of State; Missouri State Archives; Kansas City Public Library Special Collections, and the Booker-George Cemetery in Shelbyville, Kentucky. She is not listed in the Salt Fork Cumberland Presbyterian Church Cemetery nor the Blackwater Cemetery. What a busy, happy holiday for the George Caleb Bingham portraits branch of Fine Art Investigations. First came the discovery of two long sought after Bingham portraits: Joshua Belden (1802-1877) and Agnes Elizabeth Lewis (Mrs. Joshua Belden) (1806-1843). Then came fresh photographs of a portrait that is an old friend, Sallie Neill. I never cease to be amazed at the difference in black and white images, such as those of the Beldens below, from color images in these links to detail color photographs of Joshua Belden and Agnes Lewis (Mrs. Joshua Belden). Joshua Belden was a man with dark hair and fair skin, younger and handsomer than in the b & w image. Bingham, with his usual astute perceptions, engages the viewer to wonder about the personality of the man. Agnes Belden’s black dress and white fichu accentuates her statuesque beauty. The Belden portraits eluded me because they were sold shortly before the existence of online databases for art sales. When I think of the time I spent trying to track down a will for the widow of the previous owner… I am grateful to the owner of these portraits who rescued them from oblivion and who so willing shared images and information.